What's the Best Above Ground Pool Ladder and Steps in 2019? You will agree with me that pool ladders and steps are very crucial pool accessories. They provide a pool entry system that is convenient and safe. Besides that, they are a safety requirement, and in some states, the law is fully enforced. If you have just bought an above ground pool and you’re now looking for the best above ground pool ladder or steps, this will be an interesting read. Just like the pools themselves, we have so many models so choosing one may be a challenge. Today, we reviewed the top 7 best ladders and steps in the market. We also have a detailed buying guide that highlights all the essential factors to consider when choosing pool ladders and steps. That said, let’s get to business. 9.1 Why buy a pool ladder/pool staircase? 9.2 Pool Entry System: Pool ladder or pool steps? The Confer 6000X is an A-frame above ground pool ladder and an excellent choice for above ground pools ranging between 48 – 54-inches. Unlike the mid-range and high-end models, this one has a simple design and very few parts, so installation is a buzz. It has been built from high-quality resin with UV inhibitors so it can withstand extreme conditions all year round. The icing on the cake is the 300lbs. payload which seems so unreal for a $120 above ground pool ladder. But three things we didn’t like about Confer 6000X. First, it has frail steps because of the single screw on each side instead of two. If you are a DIY enthusiast, you can drill holes for two to make it stronger. (This will void the warranty). The edges are also sharp and may leave you bruised; you will need to sand them. As the name suggests this is one of the best above ground pool and in-ground ladders under $100. The low price might make you skeptical but trust me; this is a sturdy above ground pool ladder. It has been designed for pools with decks ranging between 46 – 56-inches. The payload is 300lbs, and the steps are much stronger than those of Confer 6000X. The simple design makes it easily detachable during winterizing. It occupies minimal space in the pool and won’t alter the pool water circulation. Crafted from vinyl resin, compounded with UV inhibitors, it will withstand the scorching sun as well as the freezing winter weather. On the downside, the Confer Economy is very steep; around 90 degrees descent. The rungs are also not so nice on the tender kids’ feet. But this should not be a major concern as long as they are safe. Confer STEP-1-X is the best if you want an extra heavy duty ladder for above ground pools with decks. It is designed for the large pools and heavy swimmers as it supports up to 400lbs. Another thing about this pool ladder is the compatibility with high pools. Even though it has been rated with a limit of 60-inch pools, it also has an allowance for 61-inch pools. The pathway is also extra wide at 31-inches, to accommodate the wide-bodied swimmers. The assembly and instructions might be a little bit tricky. It has quite a lot of parts and requires weighing with up to 40lbs. of sand lest it starts floating and squeaking. Also, consider sanding the sharp edges that may bruise you. The Confer CCX-AG is an above ground pool steps designed for decked pools. It has been crafted from high-quality resin, resistant to UV. 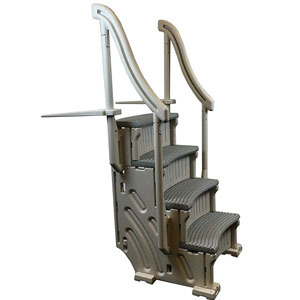 It has wide anti-skid steps and dual handrails for kids’ safety. Even though it is expensive, the 400lbs. payload is quite impressive. The frames are strongly jointed, and when properly installed, it can serve a busy pool without taking a toll on it. The curved steps can curve either inwards or outwards and are spacious enough for an adult to relax on. Our only concern with this pool steps is that it requires weighing. If improperly weighed down, it will also start floating and swaying, and that makes it unsafe. The steps also come with many parts and components, meaning it is a little bit hard to assemble it. In this complete system, the Confer CCX-AG gets additional steps that complement each other into a wedding-cake style pool entry system. The wide steps offer a nice place for relaxing. It is also convenient for small kids who like playing around the pool. 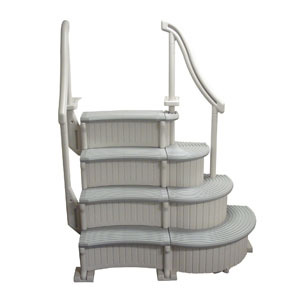 This firm and steady staircase is also great for the elderly and those with mobility problems. The sturdy and robust resin material is durable and can support up to 400lbs. On the downside, the steps turn into a single handrail pool entry system as the second handrail is too far. The installation is also a challenge as well as the weighing process (extra deck means more sand for weighing it down). It is also quite expensive at $360. But such are the prices of the high-end wedding cake-style pool steps. This A-Frame ladder has been designed to fit pool walls ranging from 48 – 56-inches. The anti-entrapment barrier protects kids from getting trapped between the rungs and rails. With separately bought accessories, the Vinyl Works SLA A-Frame can convert to a deck mounting and also attaches to some pool fences. The slide lock design enables parents to restrict access to the pool. You get all these features for around $140, and that’s not bad for a secure and sturdy 300lbs A-Frame pool ladder. One of the shortcomings of this Vinyl Works ladder is that it’s not suitable for the soft pool floors and walls. That means you can’t use it with inflatable above ground pools. It’s also unsafe for diving as clearly marked. It can sway before you dive and fall, injuring those around. This is another top choice for above ground pools without decks. Confer 7200 boasts the same features as Vinyl Works SLA, but it is a little bit expensive. It costs $250 which is a little bit on the higher side. However, note that Confer is a top brand, unlike Vinyl Works. 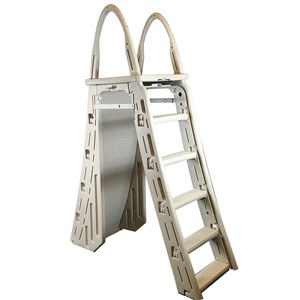 This A-Frame pool ladder has been crafted from quality aluminum material. The rungs and frames are firmly joined to offer maximum support of 300lbs. The ladder feels safe when going up and coming down courtesy of the sturdy aluminum. 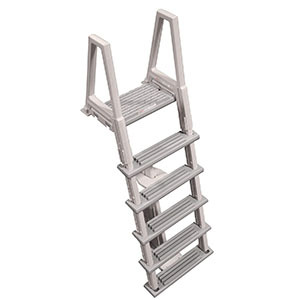 This ladder is ideal for above ground pools ranging between 48 – 56-inches. You can completely lock out access using the roll guard barrier. On the downside, it will take you longer to install this ladder. Regarding usage, it is not for inflatable pools. In this section, we are going to discuss several important aspects that you should be acquainted with when buying an above ground pool ladder or staircase. Why buy a pool ladder/pool staircase? There are three reasons why you need to consider buying an above ground pool ladder. First, pool ladders and steps are for your family’s safety. While average adults may get their way into a 56-inch above ground pool, it is not a safe thing to do. Most of the above ground pool injuries are associated with the pool entry region. Pool ladders and steps are the most effective way of reducing above ground pool injuries that can be caused by slipping. Second, pool ladders and steps are very convenient. With a pool ladder, you won’t have to be struggling, getting them inside and out of the pool. On the other hand, the steps offer a convenient joint where you can relax, enjoying the cool waters. They are also safer for the elderly and kids. The third reason is local regulations. In some parts of the United States, the ‘Premises Liability’ laws apply. This means without a working pool entry system; anyone can press for charges against the pool owner in case of injuries. Make sure your pool meets all the safety standards, and this includes having ladders or steps. Pool Entry System: Pool ladder or pool steps? Even though they sound like the same thing, these two are entirely different. Pool ladders (A-Frames) are from the ground to the floor of the pool. They help swimmers climb to the top of the pool and go down inside the water. They allow free water circulation and don’t occupy much space. On the other hand, pool steps are just from the top of the pool to inside the water and are associated with decked pools. Pool staircases are more comfortable than ladders because of the solid steps. They also come in handy when you just want to relax. Unfortunately, they take up more space and alter pool circulation. Well, if you don’t know which one suits you, here’s what you need to know. First, pool ladders are a must if you don’t have a deck. On the other hand, pool steps are ideal if you have a deck around your above ground pool or you have an in-ground pool. It is not entirely a matter of choice. The material used to craft the ladder or steps is very crucial. It determines several aspects including sturdiness, durability, maintenance and so on. Here are the pool ladder materials, and the pros and cons of each. Steel Most pool ladders are made from steel for obvious reasons. Steel offers the most robust frames and handrails. When buying a steel ladder, look for galvanized steel or stainless steel. This is because plain steel rusts very fast. The shortcoming of steel is that it requires higher maintenance. It is also heavier, and harder so hitting it is not something nice. Steel also gets hot during summer. Aluminum This is an excellent alternative to steel, especially when you’re on a budget. It is lighter but offers almost the same sturdiness. Aluminum is easy to maintain and doesn’t rust as easily as steel. However, it also gets hot as the sun scorches. Plastic/resin Plastic and resin ladders don’t get hot or cold like steel and aluminum. The two look so similar, but they are different. Plastic is lighter and safer, especially with kids. It lasts longer if mixed with a UV inhibitor. The problem is that it isn’t as tough as steel and aluminum. Resin is a plastic composite that is tougher and durable than ordinary plastic. But it also needs a UV inhibitor, or the sun will hasten decomposition. Above-ground pool ladders are not permanently fixed to the pool frame. This is to enable easy attaching and detaching because above ground pools are temporary. To hold them down in place, pool ladders need to be weighed down. There are several ways to weigh down your pool. Filter sand – Many pools have compartments for filling sand and thus weighing down the ladder. Cavities are left in the frame, steps and side rails. It is imperative that you use pool filter sand to weigh down the ladder. Using any other sand may turn your water messy. Water weighing – This method employs cavities and compartments as well. But this time, it is water that fills the cavities and not sand. Weights – Some pool ladders don’t have compartments or cavities. A solution to this is using water weights. These are add on accessories (compartments) that attach to the ladder and hold water. DIY – make your weights. Fill bottles with sand or you your neoprene dumbbells to hold down the ladder. If you want to be a pro in pool ladder and steps selection, here are the fundamental aspects to consider. There are so many pool ladder and pool steps brands such that choosing one may be a dilemma. As usual, we recommend the household names because of the excellent performance and durability. Some of the top brands include Intex, XtremepowerUS, Ocean Blue, Confer Plastics, Blue Wave among others. Just to note, these top brands are quite expensive. But let not the high price push you away. Remember the ‘you get what you pay for’ slogan. In as much as it sounds so obvious, it’s important to know your pool height. Many are times pool owner’s buy short ladders because they disregard the pool height as the focus is more on the other aspects. Ideally, if your pool has a 48-inch height, the ladder should have some clearance. Fortunately, you will find this information in the specifications. The ladders are described as best for pools from, say 48-inches to 56-inches. If you are not sure about your pool height, use a measuring tape and get the length from the ground to the top of the pool. Above ground pool ladders and steps range from $300 all the way to $1000. What brings the difference is the brand, and most importantly, the features each model offers. Wedding cake style steps are more expensive than normal curve steps. As for the A-Frames, the steel frames are more expensive compares to their aluminum counterparts. Also, the lesser known brands are cheaper while the household names are expensive. Most above ground pools don’t come with decks, but some have decks. There are specific ladders and steps for both types of pools, so you need to be very careful with your selection. Above ground pools with decks are quite similar to in-ground pool ladders. They sport dual handrails from the deck which curve, descending to the pool. Typically, they will have 3-5 steps. For those with above ground pools without a deck, look for an A-frame design pool ladder. This design allows users to climb from the ground, up to the pool’s rail and down into the water. But it is also important to note that some pool ladders like Confer PES can be used with both in-ground and above ground pools. 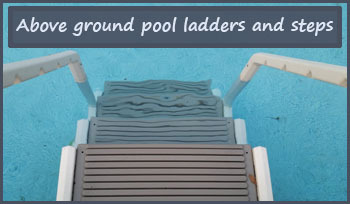 There are different pool ladders classified depending on their weight limit/duty rating. It is imperative that you ensure the ladder or steps you’re buying can comfortably accommodate your weight and all those who will be using the pool. An ideal pool ladder shouldn’t only accommodate your weight. Ensure you give yourself some allowance. This will reduce stress on the frames and steps whenever you go up or down. It also makes it safer because there’s no squeaking or shaking. Please note that the duty rating of a pool ladder is not proportional to the pool height it is designed for. 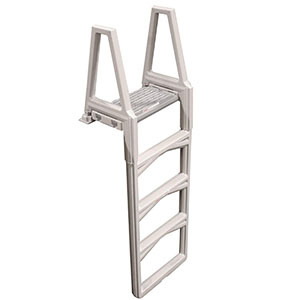 A 48-inch pool ladder may have the same duty rating as a 56-inch pool ladder. Pool safety is the most important thing when buying a pool ladder or pool staircase. The ladder should first be compatible with your pool. Second, it should securely attach to the pool frame or deck. When fully attached, it shouldn’t move around too much in the water. Above all, the handrails and steps should be non slip to prevent slipping. Advanced models have lockout features that curtail access to the pool. Some have guards that prevent kids from entrapment between the rungs and frame. These are just among the host of safety features that pool ladders offer. As a word of caution, a pool ladder or pool staircase is not a substitute for supervision. It is always to be on the watch when small kids are using the pool. There are times you may buy a pool ladder then it gets damaged not because of your fault; maybe the manufacturers’. The warranty will come in handy in such cases. It will cover your ladder; whether it is repair needed or in the worst case, a replacement. Make sure to read the warranty terms and conditions. When buying, always make sure to go for the most extended warranty. Besides the warranty length, note that these cheap and little-known brands are notorious for dishonoring warranties. For that reason, we recommend the household names. How do I drain my pool ladder or pool staircase? You should winterize your pool ladder or step. This way, it will last longer. In the case of pool ladders, lift it off the pool with an extra person to make it easier. Make it lie on the side and remove the caps on the legs of the ladder. Lift it downwards and let the water drain. As for the steps, just step on its back edge and let the water slowly drain. Why are my pool steps and pool walls turning yellow? That is a sign of algae, and it should be a serious concern considering the rising cases of Recreational Water Illnesses. The slippery nature of yellow algae is also a hazard as you can slip. To clear algae, consider acid washing the pool or enzyme shocking the pool water. How do I stop my pool ladder from floating? Using a floating ladder is running a risk. Make sure you weigh it down to make it firm and steady. Your pool may use filter sand weights, water weights or DIY weights. How to attach a pool ladder to a deck ? The first step is to place the flanges on the deck, exactly where you want them to go. Then, hang the ladder, with the bottom facing down. Make sure the rubber stops have gently rested on the pool walls. Bolt up the flanges on the deck and fasten the bolts. How to clean pool ladders? A brush is the best tool to use in cleaning ladders or steps that are made from resin and plastic composites in general. As for steel and aluminum, use a scouring pad to remove the stains. How much weight can an Intex pool ladder hold? Intex is best known for their above ground pool solutions. However, their ladders have been under in-depth scrutiny regarding the payload. All the Intex pool ladders have a heavy duty rating (300lbs/136kg). These include the 30-inch,36-inch, 42-inch, 48-inch, and 52-inch. How much weight do above ground ladders support? 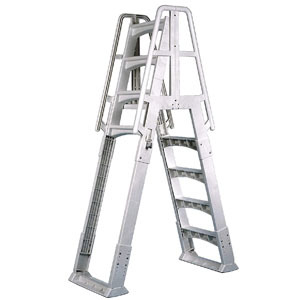 Most of the above ground ladders are medium duty and can comfortably hold 300lbs (136kg). But some heavy duty options have payloads of up to 400lbs. Most of the medium-duty ladders are the A-Frames while deck ladders hold up much. That’s it, folks. 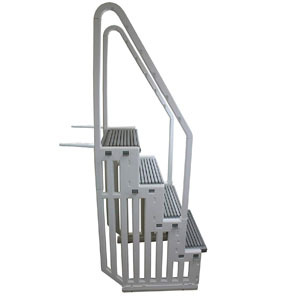 We have come to the end of our above ground pool ladders and steps review. We hope that you will finally be able to make the correct choice. Make sure to check out our other above ground pools reviews. 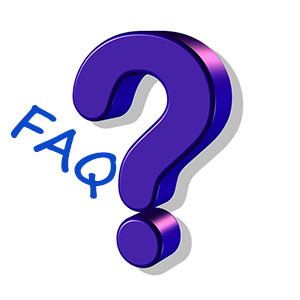 For any questions or comments, feel free to engage our experts in the comments section below.